Clarity Rx products are naturally-derived, plant-based, and sustainable. 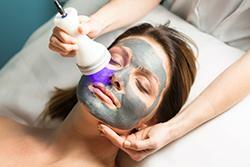 We use Clarity Rx and Dermalogica products for our Signature Facials. A Hot Stone massage uses heated stones in combination with massage strokes. This helps soften muscle tissue resulting in a deeply relaxing therapeutic massage. Request one of our Spa Associates to contact you, or call 925-400-9183.